Rowlett’s Hope in Hand food pantry will be able to continue feeding needy families thanks to the recent generosity of Keeley Elementary School. 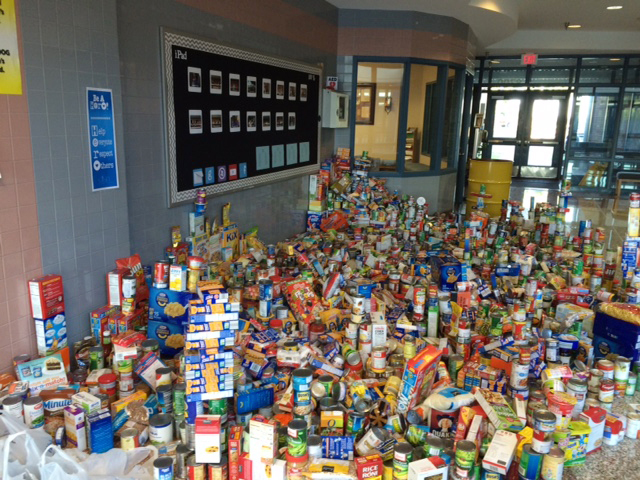 The campus donated nearly 5,000 canned and boxed food items after holding a friendly class competition. Carrie Clayton’s third-grade class collected nearly 750 items alone, and six other classes collected more than 300 items each. Picture courtesy of Keeley Elementary School. 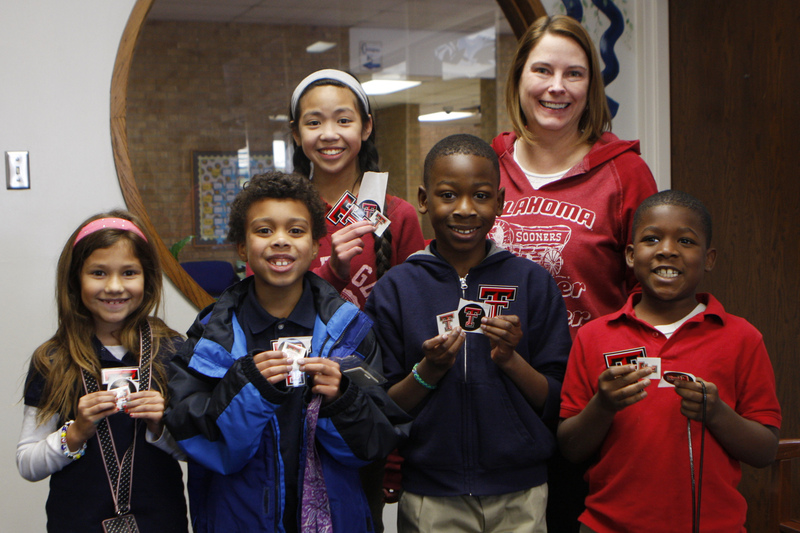 The season of giving started early at Stephens Elementary School. Students participated in two charity campaigns throughout October and recently celebrated their results. Garland ISD’s Education Foundation holds a giving campaign every fall, asking schools and departments to raise money for scholarships and grants that will later be distributed to students and staff. 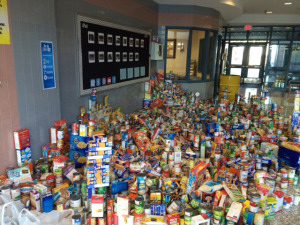 Wanting to involve the entire school, Assistant Principal Janee Haynes made the donation experience fun. She organized a Splish Splash for Cash collection, pitting classes against one another for a prize of throwing water balloons at teachers and campus administration. 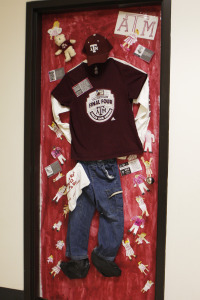 Stephens’ collection totaled more than $2,100, and the campus raised the second-highest amount of all GISD elementary schools. Tara Gilcrease’s class reaped the water balloon reward Nov. 7, throwing more than 100 at Gilcrease, Haynes and Principal Ramona Aguilar. 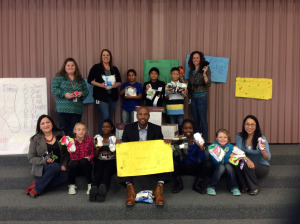 Using posters, daily announcements, a catchy song and overall school spirit to promote the campaign, fifth-graders encouraged the campus to donate new socks. They also showed off their own festive pairs to increase participation. 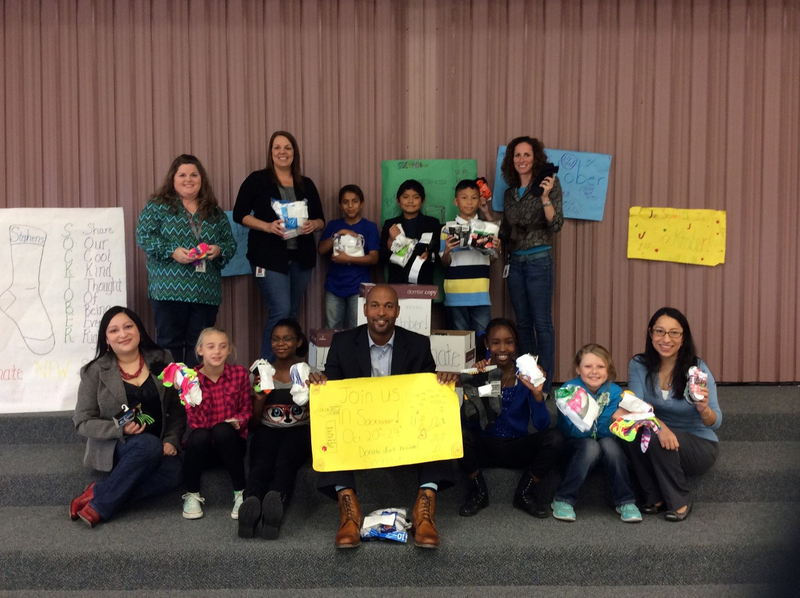 On Nov. 7, Stephens presented more than 400 pairs to the GRS Giving Place, a district-operated resource to help students and families in need. Three Garland ISD high schools were selected as some of North Texas’ top campuses. North Garland, Rowlett and Sachse high schools were included in Niche.com’s 100 Best Public High Schools in the Dallas-Fort Worth area ranking. Niche used public data, statistics and surveys to evaluate public high schools across the nation. A variety of factors were weighed to determine a campus’ rating, with an “academics grade” accounting for 50 percent of the overall evaluation. Advanced Placement (AP), ACT, SAT and state assessment scores, as well as AP enrollment, graduation rates and student-teacher ratios, affected the academics grade. After assessing all eight factors, schools were given a rating ranging from A+ to D- and ranked. RHS was the highest-ranking GISD campus, securing 47th place. Sachse followed at No. 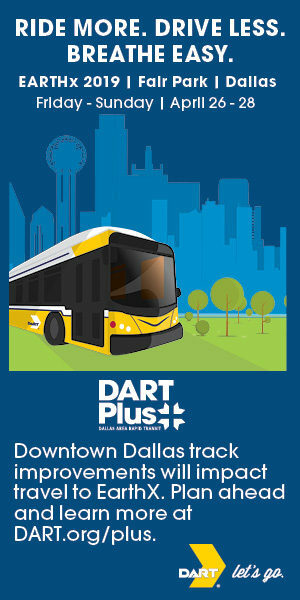 49 and North Garland at 96. Rowlett and Sachse high schools received an A rating, while North Garland obtained a B+. This marks the second time in recent history that all three high schools were ranked as some of the area’s finest. Earlier this year, they landed on U.S. News & World Report’s 2014 Best High Schools ranking. While this year’s UIL State Volleyball Tournament will not feature a Garland ISD team, the district will still make its mark on the anticipated athletic event. Students from Lakeview Centennial, Naaman Forest, North Garland, Rowlett, South Garland and Sachse high schools will showcase their vocal talents to visitors from across Texas. Fulfilling a request from the UIL, eight high schoolers volunteered to sing the national anthem during one or more of the competition’s 15 games Nov. 20-22 at the Curtis Culwell Center. The students, most of whom are athlete-singers, were selected by their campus’ athletic coordinators. NFHS junior Micah Harding, as well as Lakeview’s Brianne Sanderson and Maegan Plunk, will commence the tournament. Harding is a setter on the Rangers’ volleyball team and a First Edition show choir member. Sanderson is a cheerleader while Plunk is a Patriot volleyball team member. Rowlett’s Logan Brown, the 11-6A district Offensive Player of the Year, South Garland varsity choir member Ashleigh Carter and Sachse senior basketball player Aunalisa Clemons will make their debut Friday, Nov. 21. North Garland freshman varsity volleyball player and choir member Julia Ukattah will lead Saturday’s games, followed by Rowlett A cappella and show choir member Jordan Godwin. A list of the students’ performances is below. To learn more about the 2014 games, including bracket, broadcast and ticket information, visit the UIL State Volleyball Tournament’s website. 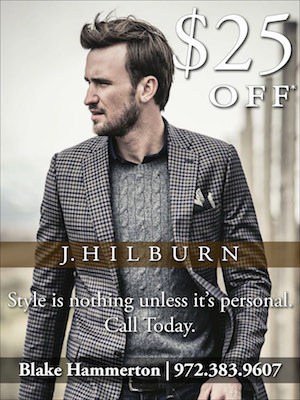 This is the Culwell Center’s third time hosting the event. Following a victorious 33-6 win against Killeen Shoemaker in Waco Saturday, Nov. 15, Rowlett High School has qualified for the Area round of the UIL state football playoffs. The Eagles will face Mesquite Horn at 7:30 p.m. Friday, Nov. 21, at Dallas’ Cotton Bowl Stadium. Although Rowlett possesses an 8-3 record, their opponent has been fierce on the field, winning 10 of 11 games. But that does not stop RHS Athletic Coordinator and Head Football Coach Doug Stephens from believing his team is ready to confront the Jaguars. “We have our work cut out for us, but we will continue to play the way we have all season—everyone focusing on their job and getting it done,” he said. “Advancing this far into the season is a great accomplishment, no matter the outcome. We are excited about Friday and proud of everyone on the team.” As the last remaining district contender in the competition, RHS will fight to keep Garland ISD on the playoff map. And if the Eagles best Mesquite Horn, they will play with the winner of the Bowie-Klein Oak match. To catch Rowlett and Mesquite Horn go head-to-head live, tune into KTXA channel 21 at 7:30 p.m. game day. For tickets or more information on Friday’s game, visit the GISD Athletics Department’s website. Striving to offer the best possible education experience, Garland ISD often evaluates it curriculum, instruction, communication and current initiatives. The district is seeking feedback from parents about what they perceive as the most important measurement of student success. GISD has partnered with the Region 10 Education Service Center to conduct a brief survey, which is available here or by calling 469-615-2000. Parents are encouraged to complete the survey before December 31. Several Garland ISD schools commemorated the Texas Higher Education Coordinating Board’s project Generation TX by participating in GenTX Week Nov. 17-21. Spring Creek Elementary School was among the celebrating campuses. 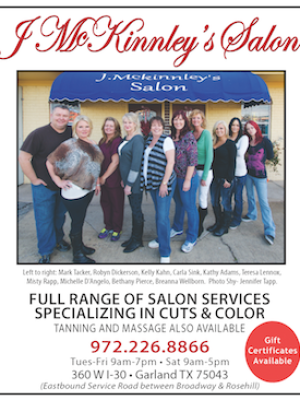 Counselor Kimberly Hendricks organized exciting and enlightening activities, contests and programs. 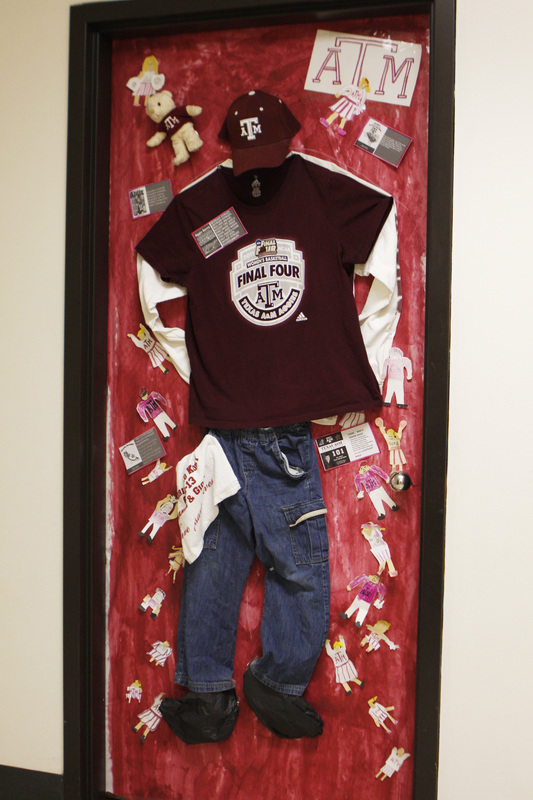 Hendricks conducted a college-themed door decorating contest, which was judged by the district’s Guidance and Counseling Department. She assigned Texas colleges and universities to teachers, who then enlisted their students’ help to gather campus facts and design the layout of their creation. Teachers talked about their college experiences in daily announcements and casual dress was allowed for those wearing university spirit gear. 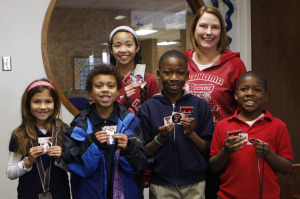 College trivia contests were also conducted every day, with winning students receiving donated gifts, such as Arlington Baptist College mini flags, Texas A&M temporary tattoos and University of Texas at Dallas pens. “The kids have really learned a lot and had fun doing it,” she commented. “I think what they experienced this week will stick with them in the long run.” And to continue promoting college readiness, the first-year counselor has arranged a fifth-grade field trip to Richland Community College for the spring semester. Giusti began her career as a chemical engineer in Venezuela. She obtained her teaching certificate and traveled to the United States two years ago in search of additional opportunities. When she received the teacher of the month nomination, Giusti reached out to friends and family members back home. Giusti won Jupiter Chevrolet’s Facebook contest with more than 1,000 votes. 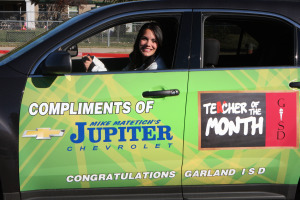 Receiving the car as a prize, she get to drive it until Garland ISD’s Winter Break. A new winner will be named in January. 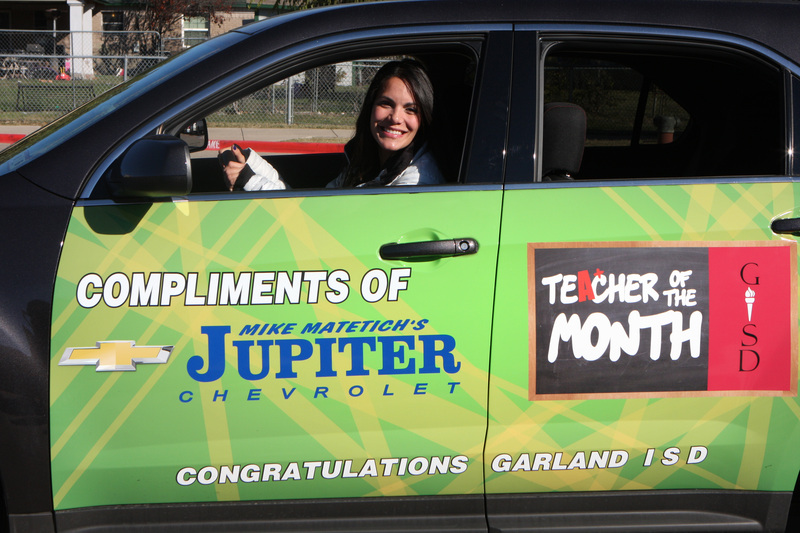 Jupiter Chevrolet’s Teacher of the Month contest recognizes the important work of GISD educators and rewards them for their dedication. Want to see your favorite educator honored? Vote now on their Facebook page.